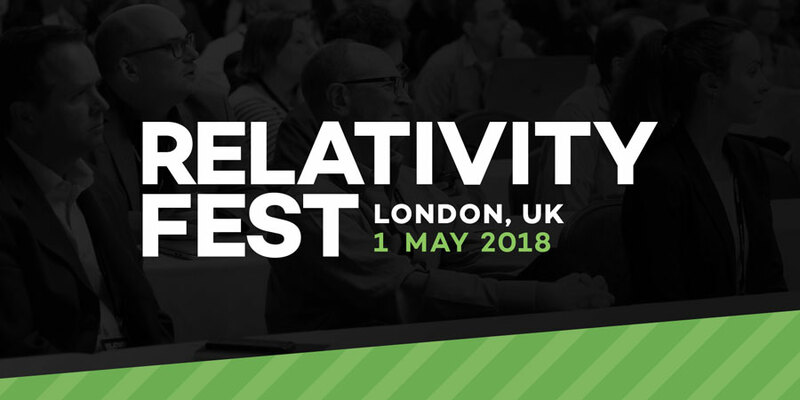 Relativity Fest London takes place at 155 Bishopsgate on 1 May. That and the Nuix event which I attended recently (I wrote about it here) have effectively displaced most of the more generalised eDiscovery / eDisclosure events in the London calendar, offering a mixture of product-specific technical sessions and panels to do with the context in which the technology is used. From a potential new disclosure rule for England and Wales to the General Data Protection Regulation (GDPR) affecting Europe and beyond, new rules and regulations are changing the duties and the roles of the participants in the e-disclosure process. Senior judges and rule-makers on both sides of the Atlantic have called for more judicial “stewardship” of the discovery/disclosure process, but many judges have resisted taking on this role. With the UK’s GC100 calling for comprehensive change in the disclosure process, what other legal professionals could see their roles change? Will judges in the UK become more active in the disclosure process, and will lawyers cooperate more? Mr. Justice Birss joins United Kingdom and international experts to apply the rules and regulations to your role. The panel member of most interest in this context is Mr Justice Birss. His was the judgment in Smailes v McNally which I wrote about here, describing it as “the disclosure case of 2014” and referring to “its analysis of almost every point which can arise in an argument about electronic disclosure”. The other panel members are the always-welcome Karyn Harty of McCann FitzGerald in Dublin, Ed Crosse, the Simmons & Simmons partner who has been the de facto lead in disseminating information about (and seeking feedback on) the new disclosure rule, and Wendy King of FTI Consulting. David Horrigan of Relativity is the moderator. There is a lunchtime discussion led by Women in eDiscovery over lunch and, inevitably, a “GDPR last-minute preparation checklist”. The closing session is called International disclosure, data privacy, United States v Microsoft, and the Cloud Act at which retired US Magistrate Judge James Francis IV will be joined by Rachi Messing, Senior Program Manager at Microsoft, to discuss the implications of this most significant test of US eDiscovery reach. Judge Francis made the original order in favour of the US, authorising US access into Microsoft’s Dublin servers. The most recent appeal came before the US Supreme Court in February, but Congress has since passed the Cloud Act which, as Microsoft seems to agree, appears to make the Supreme Court’s opinion irrelevant. A packed programme, then, and one I am very much looking forward to participating in. This entry was posted in CPR, Discovery, eDisclosure, eDiscovery, Electronic disclosure, FTI Technology, Relativity, Relativity Fest and tagged David Horrigan, Ed Crosse, Judge Francis, Karyn Harty, Rachi Messing, Wendy King. Bookmark the permalink.